Lionel Taylor had an amazing career that began in 1959 playing for the Chicago Bears. He didn’t record a reception for the team during his rookie year and opted to join the upstart American Football League during its inaugural season in 1960 for the Denver Broncos. Taylor went on to endear himself as one of the most dominant receivers in the history of the league, leading the AFL in receptions 5 of the next 6 years. In 1961 he set a modern era record with 100 receptions (which was broken in 1964 by Charlie Hennigan at 101). He played for the Broncos through 1966- joining the Oilers for the 1967 and 1968 seasons. Lionel retired from the gridiron in 1969. 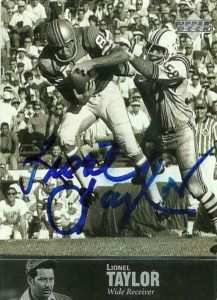 Taylor established himself quickly as an up and coming assistant coach with the Steelers as a receivers coach in 1970. He’d remain there through 1976, cultivating a reputation as a Super Bowl winning positional coach. He joined the Rams from 1977-1979, where he was offensive coordinator in 1980 and 1981. Lionel then applied his trade at the college level for Oregon State, and then as head coach at Texas Southern through 1988. Returning to the NFL in 1989, Taylor worked with the Cleveland Browns tight ends and as a pass coordinator. Taylor joined the World League of American Football in 1995 as offensive coordinator to the London Monarchs. As the league rebranded to the NFLE, he’d take over as head coach of the franchise in 1996 and shepherd the franchise through to become the England Monarchs. It was a tough run for Taylor as head coach at the end, as his team was a vagabond franchise playing all over England looking for a new home. Since there was no established fan base, this gave the Monarchs no home field advantage. The Monarchs finished with a 3-7 record during their swan song season. Taylor has fully retired from the sport and lives in New Mexico. At a clip over 800 days, I had fully given up on getting a response from Lionel, so this one came as quite a surprise to get back. It’s a shame, as with many American Football League players, Lionel has gotten little to no traction in Hall of Fame circles, despite his impressive numbers.